Oh brother, you are really making it difficult for me to select a subject for that commission I want. This faux-Carter cover is simply to die for, not only for the excellence in execution, but John Carter is almost my favorite Burroughs character. ERB's Mars had a lizard-like critter featured, except it had six legs, three on each side - yours is missing a pair! Also, clothes? Red Martians always wore jewlery and not much else, according to ERB's stories! Mind you, that might be "edited" for public consumption, which excuses your cover! That was very interesting, I do love to see the process from artists, it adds another layer to my enjoyment. Wonderful work too, the world needs more "impossible books", I think. Awesome pic!!. I can't wait for your next Pseudo Cover. I'd buy that book for the cover alone. Awesome cover! 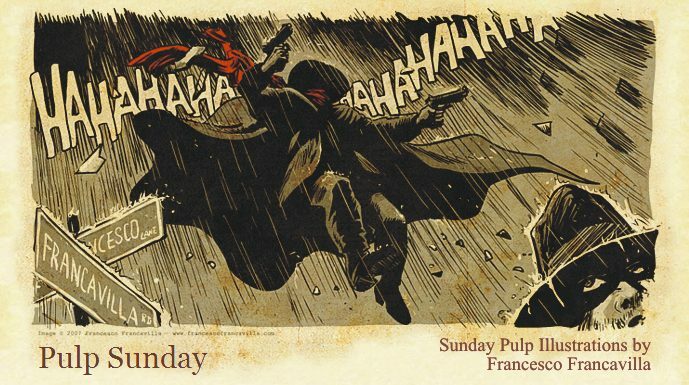 The whole thing is great, but I think my favorite part may be the "Pulp Sunday" logo. Very, very cool cover idea. I like the reptile...very old-school. Love that cover, man. Excellent.